For the next instalment of our When I Grow Up... series, we catch up with illustrator Rachel from Penelope & Pip. The talented Aussie's blog has fast become a favourite thanks to her creative and simple DIY's (we cannot accept blame for an afternoon of procrastination due to reading archive!) so read on to find out more.. So who is Penelope and Pip? Penelope and Pip is the moniker I use for my illustration, design and DIY adventures, but the name comes from two little characters I created when I first started drawing again a few years ago after a long hiatus from the ink and paper. Penelope is a little girl and Pip is her cat. I get a lot of comments that she looks like me and I do have a sweet cat or two so I wonder sometimes if it was an unintentional self-portrait! I like to imagine they have lots of grand adventures together and live happily on a beautiful farm in the country like I one day hope to. What made you first want to become an illustrator? I love telling stories and illustrating is such a fun way to do that. I can't pinpoint a time when I decided I wanted to make the transition from my work as a teacher to becoming a full time illustrator as the process has been quite organic. I do know that I love drawing and find it really inspiring to be doing a job I really enjoy each day. Where do you draw your inspiration? I have a lot of crazy dreams! My ideas just seem to pop into my head like little explosions of colour and magic so I think I am very lucky that way. I am inspired by all the quirky things in our lovely world (like unicorns and rainbows). I always tell people my illustrations are like little one page storybooks. I like to draw characters that evoke happiness and peacefulness and scenes with a bit of mystery and adventure. I always write a little passage to go with my drawings that tell the story which is a really fun part of the process. Could you describe your average day? I am fortunate to work from home so my day consists of muesli with the cats, illustrating in my studio, lunch in the sunshine, crafting, blogging and a lot of yoga to keep my drawing arm in shape. What can we catch you doing in your spare time? I am a hopeless addict to crafting so I can usually be found back in my studio creating something whimsical to share as a DIY. I also love lazing in the sun watching my favourite TV series (of which there are many!). 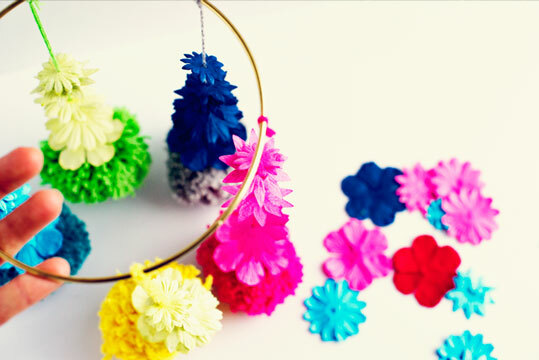 We love your crafty DIYs on the blog. Do you have a favourite? Oh, gosh! That is a tough question. I love the Pom Pom Chandelier I created recently and the Sparkle Top Pencils as they were an idea from my gorgeous little niece. Practice, practice, practice! Spend a lot of time working on your craft and then your skills are not just restricted to your favourite style, which in turn means more freelance work is than available to you. And try not to compare yourself to others - you are your own unique illustrator and that is what makes you special! You can view more of Rachel's work here and her DIY's on her blog here.